APSO IS NOW EVERGREEN - YOU CAN ADVERTISE & SIGNUP FOLKS YEAR ROUND NOW!!! This course would not be what it is without your participation and support!! I could not do it alone - we need a spectrum of perspectives, methods, techniques, philosophies, and more to bridge the gap between where we are and where we need to be. With your help, we will make it happen!! I’ll be sending out emails with updates, new free stuff to share with people to get them excited, and weekly content to share. Thank you so much for being part of our team! Scroll on down and check out your resources - read through the email samples and see what feels right to you: you can always edit it! Start working on promoting the course: make a schedule, make a plan, and stick to it! Your positivity, sharing of critical facts and information, and samples of the course will guide you to connect with those who need this course most! From that point on, it’s all downhill!! Don’t Forget!! Contest #1: Reach 10 Signups & Win 2 Giveaway Signups + All 4 Books + Access to All Our Courses!!! Please Note: I’ve added spaces for you to add in links, but please take the time to go over these carefully and adapt them to “I” or “We” or to your own word choices or personal voice. These are to inspire, guide, and help you, but they do require adding in the links here and there. Use the Pieces from the Sections below to assemble an email. Avoid Batch Emails via Gmail, Hotmail,etc. Those get blocked nowadays. Avoid Sending Too Many Emails - Once a week or every other day can be great IF you provide FUN STUFF like the FREE Stuff & You Keep it FRESH!! I usually don’t write about permaculture design programs, but I wanted to take a moment to highlight the amazing work of ThePermacultureStudent.com aka Matt Powers: he has gathered an incredible group of teachers - over 70 from around the world - and using the first peer-reviewed permaculture curriculum, that he wrote, he’s now launching, The Advanced Permaculture Student Online, the most ambitious and in-depth permaculture course ever conceived, and you don’t want to miss it. It’s a project-based advanced permaculture design certification course, the first of its kind, and it’s lifetime access! On top of all this excitement, there’s an early bird discount for a limited time that is 30% off - See what’s possible in social permaculture, ocean restoration, advanced gardening, carbon farming, mycology, renewable energy, permatecture, the regenerative economy, deep soil science, urban permaculture, and so much more! Advanced Permaculture is here, and it leads directly to career paths in the regenerative economy, but where can you learn about Advanced Permaculture and from who? There are so many career paths since every role in our current economy has a regenerative twin just waiting to be inspired into existence - how can 1 instructor be an expert in it all? What about over 70 teachers in a globally peer-reviewed, student-centered, project-based 6 month program? What if it was lifetime access with a support group discussion-based community format? What if I told you it was HERE now? The Advanced Permaculture Student Online is EXACTLY as described above and it’s AMAZING. How do I know? I’m one of the teachers in the course!!! You can signup HERE for a limited time at 30% OFF - that’s $300 OFF!! You’ve Waited Long Enough - Don’t Miss This Opportunity to Dive Into the Regenerative Life of Your Dreams!! There’s only 1 peer-reviewed global, all-climate, full-spectrum permaculture textbook currently available and it expands what has been accepted permaculture to new areas like ocean restoration, current mycology, current soil science, renewable energy, permatecture, social permaculture, regenerative entrepreneurship, holistic management, the regrarians platform, and more - do you want a free copy? Reviewed by a broad range of experts from Masanobu Fukuoka’s editor and student, Larry Korn, to Urban Market Gardener, Curtis Stone, from soil expert Dr. Elaine Ingham to health expert Dr. Jeanne Wallace, from ecological landscaping business leaders like Erik Ohlsen to seaweed farming with Antoinette and Dan Marquez - this book has EVERYTHING. It finally organizes Permaculture into an academic format that connects to the greater world outside the homestead and garden. CLICK HERE [LINK TO EBOOK] to download a copy of The Permaculture Student 2 by Matt Powers, and CLICK HERE [LINK TO LANDING PAGE] to watch exclusive videos about The Advanced Permaculture Student Online, the INCREDIBLE Online course Matt is hosting with over 70+ experts from around the world. The free book is the basis for the advanced course, so you can get a really clear idea of the amazing educational experience this course: This the first project-based, student-centered Advanced Permaculture course ever offered!! If you like the book, you are going to LOVE the course: it’s a TON more information and so many amazing teachers - not to mention the incredible community! Did you know there’s such a thing? There are people making money with permaculture outside the PDC teacher and consulting circuit - they are almost all finding the permacultural twins of roles found already in the degenerative economy though some are creating new roles in the emerging regenerative economy. You may even have heard of these new developments: goat herds are replacing chemicals and machines to manage landscapes regeneratively, rooftop farms are appearing in cities, large-scale thermophilic composting is becoming common in municipalities everywhere, and regenerative large-landscape restoration is becoming profitable too - just to name a few. As the foundation of our economies and cultures, the food, fiber, fuel, energy, and medicine production shifts to regenerative sources, the value added products and services will align with that base, and socioeconomic trophic cascades will occur as bioregions find equilibrium and abundance, but it starts with first spread the new regenerative career paths. If you want to learn more, you can even download the textbook the course is based on for FREE - it’s peer-reviewed by experts like Darren Doherty, Dr. Elaine Ingham, Peter McCoy, and more. Click HERE [LINK TO EBOOK] to download it and check it out! It’s the first peer-reviewed permaculture textbook, and it’s designed for high school students and college students (it’s easy to read but covers high level science). Title: Making Money with Permaculture? You don’t have to be a PDC teacher to make money with Permaculture? You can apply Permaculture to ANYTHING and get a regenerative solution for that problem - even outside the garden! That’s why amazing experts like Dr. Elaine Ingham, Peter McCoy, Darren Doherty, Dr. Jeanne Wallace, and over 70 other regenerative professionals are teaming up with Matt Powers in The Advanced Permaculture Student Online, the first advanced permaculture design certification program of its kind. It’s project-based and student-centered, so you actually create something real based on what you want to do, and that is your certification: it’s NEXT LEVEL, and I’m so honored to say that I’m one of those teachers!! See what the course is based on - download the first peer-reviewed permaculture textbook EVER, fully cited and full spectrum. It includes Ocean Restoration, Mycology, Renewable Energy, & so much more - CLICK HERE [LINK TO EBOOK] to download The Permaculture Student 2, the 2nd edition. Want to check out the course itself? CLICK HERE [LINK TO LANDING PAGE] to watch course excerpts and learn more about this incredible and unique opportunity. It also includes INCREDIBLE bonuses, ebooks, audiobooks, and an entrepreneurship and educators add-on course worth $597!! For a limited time, join The Advanced Permaculture Student Online for a 30% Early Bird Discount + All the AMAZING Bonuses - CLICK HERE [LINK TO LANDING PAGE] and Learn More! Thank you for choosing to live regeneratively!! Title: How Will We Regenerate Our World? There are many people out there who are uncertain, scared, in denial, drained of hope, and running away from reality. Our world needs help - it needs regenerating. It’s up to us - our governments are not going to move fast enough or force us to change: we have to make the hard choices now to make tomorrow livable…. BUT it’s really not all that dark and arduous a journey as we’d think: the path to an abundant future is thick with purpose, meaning, and holistic benefit. We can heal the earth and make a good living at the same time - there are folks doing it right now: I know some of them. They love their lives and love what they do for a living, and they are a growing crowd of happy people doing good things, and we want everyone to have a chance to live fulfilling and positive lives. That’s why we’re teaming up with The Advanced Permaculture Student Online and over 70 teachers from around world and host, Matt Powers, to connect you with career paths that help you help yourself, your neighbors, the environment, and the future. Find your niche in the abundant future that permaculture can bring. Have you heard of Matt Powers, the high school teacher turned permaculture author and educator? He was teaching in one of the poorest counties in California and the 6th most violent county in America. His students had limited options - it drove Matt to start creating The Permaculture Student Series and his new online course, The Advanced Permaculture Student Online, which is setting a new standard for permaculture education with over 70 diverse professionals that span the regenerative spectrum. If we want a regenerative economy and a livable future, we need the career paths to make it possible. Teaming up with Matt Powers and the advanced team, we are making this possible! We can take back the momentum and turn things towards connecting college students and adults to real solutions and real career paths that honor them, the earth, and their legacy. Title: What comes after a PDC? A PDC or a permaculture design course introduces you to permaculture and helps you design a sustainable home site. Have you heard of Matt Powers? Matt’s a former high school teacher, now permaculture author, gardener, vlogger, and online educator and he is organizing a massive online course involving over 70 educators from around the world focused on regenerative career paths and lifestyles. There’s never been a course like this before - it goes further than any permaculture course ever created tying in the riparian and ocean restoration, alternative energy, permatecture, social permaculture, and so much more as it goes to new depths in soil science, mycology, keyline design, life planning, and more! Get your advanced permaculture certification and find your niche in the regenerative economy! You can stop being part of the desertification and degradation of our world: You Can Be The Solution! Join this one of a kind course that covers more ground than any online course ever has!! It’s not too late! You can join The Advanced Permaculture Student Online and be part of the Regeneration! Get your advanced certification & make it REAL!! Don’t Wait!! Signups will close before you know it! Did you download the FREE ebook the course is based on yet? It’s INCREDIBLE and the only peer-reviewed permaculture course ever written! WILD RIGHT? Download that HERE. It’s incredible the breadth and depth in this course - no matter who you are or what you are interested in, you’ll find yourself stretching your understanding further and deeper than ever before. 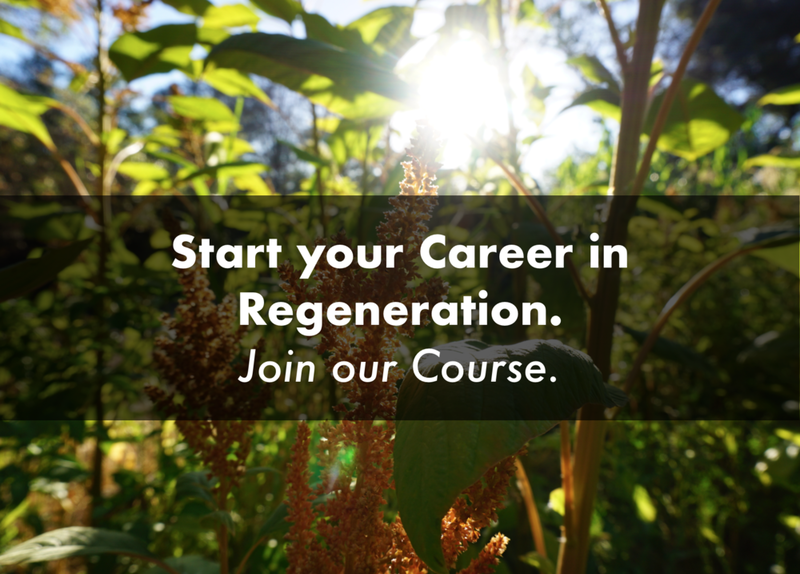 If you are looking for something to change your life, The Advanced Permaculture Student Online with over 70 expert teachers from around the world is an amazing place to do it: Grow Regeneratively with Matt Powers - Click HERE [LINK TO SALE PAGE] & Join the Regeneration! Title: Last Call on Early Bird Pricing!! Thank You for Living Regeneratively!! The Advanced Permaculture Student Online Signups CLOSE THIS WEEK!! This is a powerful, life-changing course that is designed for EVERYONE to make the Regeneration REAL in their Life! Authentic Project-Based Learning is the cutting edge of education, and Matt Powers along with a HUGE Group of Teachers are guiding students through transformative experiences with advanced permaculture: students are launching businesses, healing landscapes, healing people, and rebuilding communities and local economies. We need EVERYONE so please take a moment to check out and see what is being offered. It’s EXACTLY what we need to guarantee a brighter future for all: a clear pathway to a regenerative future! Click Here [LINK TO Landing PAGE] to Learn More - See you in the Course!! Earn your Advanced Permaculture Design Certification + a Standard PDC too! You’ve waited long enough - Don’t Let This Go! You Deserve THIS! The Advanced Permaculture Student Online is the BEST Permaculture Course Online. It’s the most advanced, in-depth, and up-to-date; it also has the most experts and educators supporting it. It’s also based on the ONLY peer-reviewed textbook series. It is the ONLY advanced permaculture certification program based on peer-reviewed permaculture curriculum. This is the ONLY Student-Centered, Project-Based Permaculture Certification program as well. You are the ONLY person who can change your life and respond to all the problems you see in the world. It’s ONLY us that stands between a brighter future for all and extinction. It’s our time to rise and make the difference!! This is the greatest challenge of our generation!! Share on your Personal Pages and Accounts, in Groups and Forums, on Pages you Like, and on Blogs you Read or Write. Be POSITIVE - there's nothing like a smile and a positive attitude to brighten someone's day and connect them to something that will improve their lives! Post #2 - Join the Regenerative Economy! Post #3 - Are you searching for Advanced Permaculture? Post #5 - Is it Possible to Make Money with Permaculture? Post #6 - How are we going to reverse the damage? Post #7 - What Will Your Future Be Like? Post #8 - Is it Possible to Heal the World with Every Purchase, Action, & Interaction? Post #9 - Can we Heal our World? The Permaculture Student 2 eBook - the 2nd Edition, NEVER BEEN SHARED BEFORE! 40 Pages Longer!! The Regenerative Career Guide eBook - See What Careers Advanced Permaculture Connects To!! More to come - I will have The Permaculture Student 2 Workbook ebook and The 5 Steps to a Regenerative Future ebook as give aways in the last weeks before we launch! "I've always understood intuitively that everything is connected, but the course has clearly illustrated in tangible ways how this is true. I've taken Elaine Ingham's Soil Food Web course and had the pleasure of hearing Darren Doherty speak in Santa Barbara and read P.A. Yeoman's Water for Every Farm, but this is the first time I have seen all of it presented as an integrated coherent whole. It's almost like studying the respiratory system, the circulatory system and the digestive system - and then experiencing them as a living thriving whole body. It's systems within systems. Very cool!" -James B. "Thanks for taking a bold leap and including these sometimes difficult to talk about topics in a permaculture course. You're the man Matt! -David V.
Thank you again for being an affiliate - this is an exclusive group & we are spreading the regeneration in a new empowering egalitarian way: thank you for joining us! !